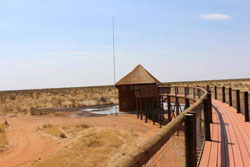 Namibia Wildlife Resorts Olifantsrus Campsite is the newest camp to open inside Etosha National Park, located in the previously under-utilized western region. 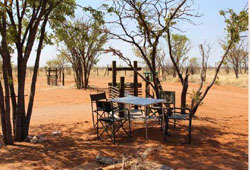 Olifantsrus is approximately 130km from Okaukuejo, 60km from Galton Gate (Otjovasandu) and 50km from Dolomite Camp and offers a camping only experience. The camp opens at sunrise and closes at sunset as per the general park regulations and day visitors are only allowed to use the picnic facilities up until 16h00. 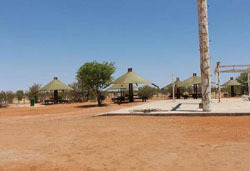 The camp’s picturesque picnic facilities are also open to day visitors. Currently, there are no braai facilities for campers, only flat bases to make fire. 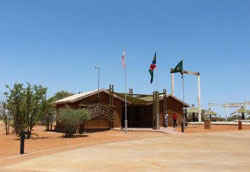 Day visitors pay an entry fee of N$ 50 per person at the reception upon entering Olifanstrus. One of the key attractions of Olifantsrus Campsitesite is the state of the art hide which is probably the first of its kind in Sub-Saharan Africa or Southern Africa. This is a double story building (hut) with aluminium glasses around it in front of a man made waterhole engineered for peaceful game viewing.